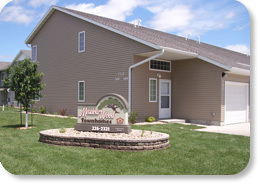 Meadow Wood Townhomes is a six building complex, with a total of 32 Townhome units (2 handicap accessible). The Townhome units consist of two, three and four bedroom floor plans ranging from 1,036 square feet to 1,597 square feet. Each unit has private front and back entrances with an attached single stall garage, along with a range, refrigerator, microwave with hood, dishwasher, central air conditioning and washer and dryer hookups. Service animals are allowed if the proper documents are received by AHA. Rent is NOT 30% of your adjusted income. Tenants are required to pay a set rent unless they are using a Section 8 Voucher; then rent will be 30% of their adjusted income. All new applicants must fill out the Aberdeen Housing Authority’s application. After the entire application is filled out and the proper information is turned in, the new applicant is placed on the chosen program’s waiting list. This is a first come, first serve basis depending on the individual qualifications. The applicant will be mailed a letter stating that they have reached the top of the waiting list when his or her turn has arrived. All waiting lists vary and the AHA can not predict how long it will be before a unit is available.